Desmond O’Donovan, a student at the Science Leadership Academy chose to study animal-car collisions for a school project on a local or global issue. Driving along Cresheim Drive earlier with his Dad, he saw a young deer felled on the sidewalk and came back later with his Mom to photograph and examine the mishap. He’s been doing research into the issue and sharing his information with classmates and on blogs. He believes collisions might be reduced by educating drivers to drive more slowly in the Wissahickon where, he says, deer are overabundant and possibly, also, by lowering the speed limit. For the activity requirement of his project, O'Donovan may try to raise awareness about the problem. 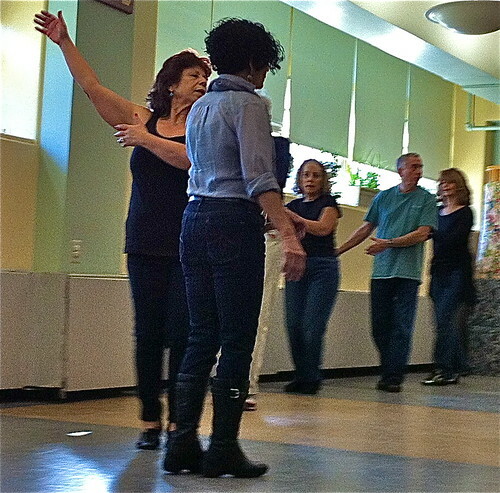 You might be interested to know that i have decided what i am doing for the project. 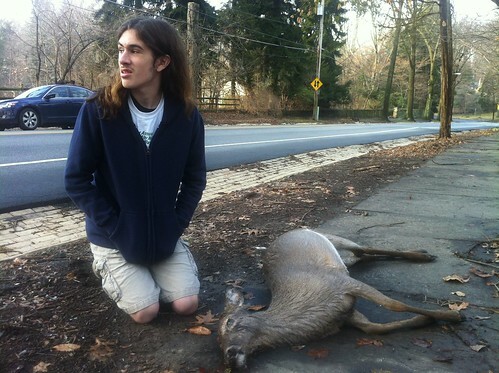 i'm going to try to get a deer crossing sign posted on Wissahickon Ave and Mount Pleasant. In her book, “The 7 Secrets of the Prolific, the definitive guide to overcoming procrastination, perfectionism and writers bloc,” Hillary Rettig offers many insights and tips for authors and others on how to become successful. It’s not laziness or lack of discipline that keeps people from moving forward, Rettig says, but dis-empowerment, meaning they have temporarily lost access to their skills and strengths including their capacity to write. Perfectionism is the biggest constraint according to Rettig. She says that perfectionists set impossible standards and then punish themselves when they don’t achieve them. 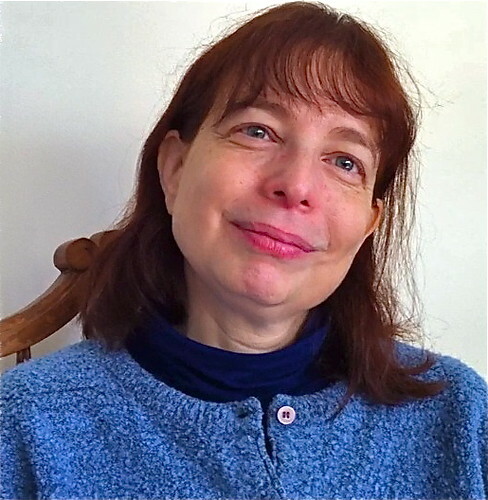 Along with offering insights into the barriers that writers face, Rettig offers strategies in line with her philosophy of “compassionate objectivity” like managing one’s relationship with one’s writing. One technique is doing timed writing exercises and giving oneself little rewards upon completion, whether it be a good stretch or a little treat and appreciating what she or he has done by engaging in the process. 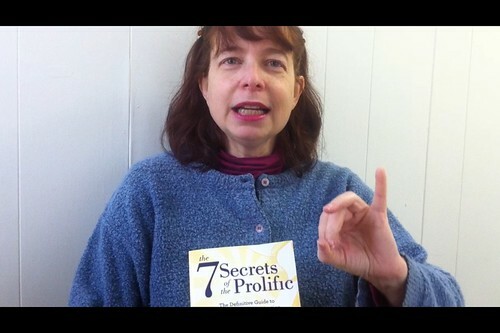 Rettig, who also authored “The Lifelong Activist” has practiced her philosophy and techniques in her own writing . She gives workshops on perfectionism and time management online and in other places. Her books are available through Amazon and other retailers or through her website, www.hillaryrettig.com where she offers free information and useful articles. Watch video interview here. 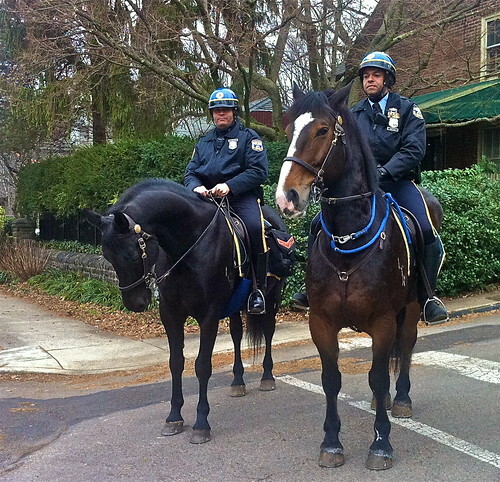 Officers Manuel Lorenzo (left) and Carmello Oquendo (right) were patrolling Chestnut Hill along Highland Avenue astride their mounts. Lorenzo was riding Ruben, a black coated Dutch warmblood and former dressage horse and Oquendo was riding Ranger, a rescued Belgian draft who had been pulling farm carriages. The policemen are two of the 12 officers riding horses from a stable of 15. 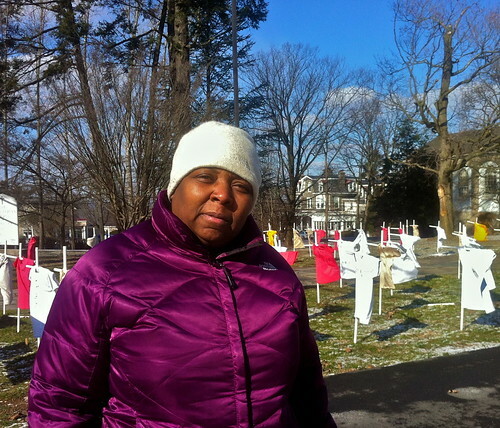 They patrol throughout the City, says Oquendo, and could be in Chestnut Hill one day and in Old City, the next. Although there were a couple hundred in the unit in the 1950s and 60s, the hope is for the unit, re-introduced in 2010, to build back up to a more recent level of 30 riders. Although the officers can perform all regular police functions, their main purpose is deterrence and the officers equate a mounted duo’s effectiveness to that of 20 officers walking a beat. The horses are trained to deal with different conditions, disturbances and people. Ruben and Ranger were receptive to pats on the neck and the officers say they are good for community relations - the public loves them. The Philadelphia Police Foundation website accepts donations at http://www.phillypolicefoundation.org/projects/mountedunit/ to rebuild the mounted patrol. Watch short video here. 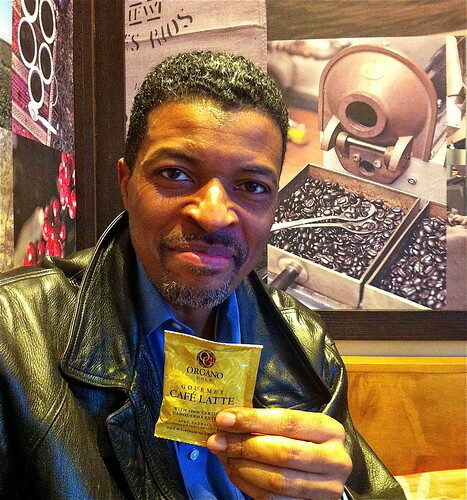 “Organo Gold” coffee is a game–changer, says Derrick Carter, an independent distributor for a line of products including not only coffee but also toothpaste and soap, all containing the Chinese herb ganoderma. Boasting sales of the coffee which he says have climbed from merely a couple million dollars four years ago when the company was founded to $400 million this year, Organo aims to capture 1% of the coffee market in the U.S. Coffee is merely the mechanism, says Carter, for delivery of the herb which is touted to oxygenate and detox the body, support the immune system and increase energy and stamina. Working at his laptop at the Flourtown, PA Starbucks coffeehouse, Carter offered your correspondent free samples of Organo Gold coffee and tea. Watch video interview here. 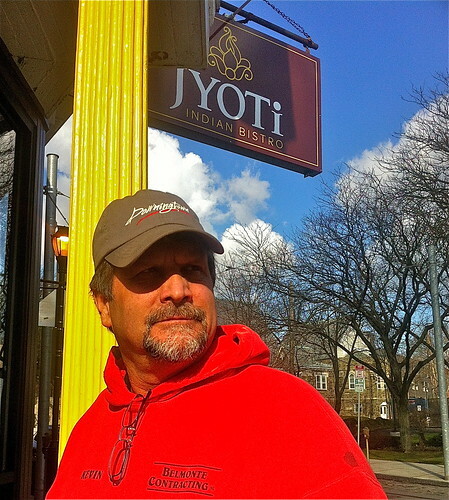 Kevin Belmonte, a builder, was applying finishing touches to the about-to-open eat in-/take out Indian restaurant, Jyoti, pronounced “joy tea’ in Mount Airy. Belmonte has been acquainted with the husband and wife owners for 10 to 15 years and worked on moving them from Sharon Hill, PA into their new larger processing facility near the airport. Jyoti, which had been doing trays for the airlines, expanded to canned and then to plastic packaged foods. Now they are branching out through their son with a retail operation in Mount Airy. Belmonte says the vegetarian fare will reflect the culinary skills of Jyoti who, Belmonte says has a “PhD in healthy food.” Watch video here. In Bethlehem, because there was no room at the inn, in a barn Mary had just given birth to a baby boy named Jesus, weighing in at 8 pounds 2 ounces. Wise men guided by the north star brought gifts of gold incense and myrrh. 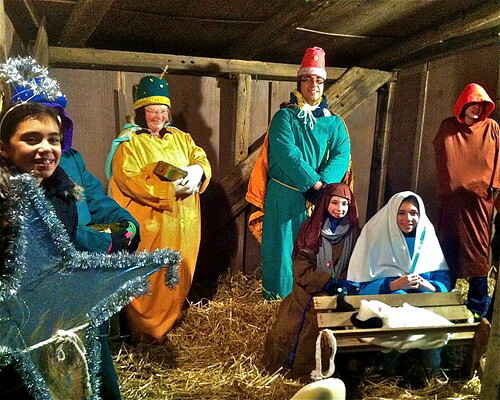 Baby Jesus was wrapped in white linen and in this reenactment of the nativity scene by members of the Conshohocken PA Methodist Church, wore earmuffs because of the cold. Watch video here.